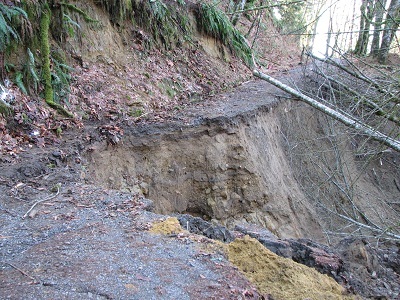 Landslide hazard areas are areas potentially subject to landslides based on a combination of geologic, topographic, and hydrologic factorrs. They include areas susceptible because of any combination of bedrock, soil, slope (gradient), slope aspect, structure, hydrology, or other factors. Modification of topography and vegetation in landslide hazard areas is carefully regulated in order to preserve long-term stability of sensitive slopes, reduce erosion potential and stormwater runoff, and preserve related ecological values.